To take advantage of our exclusive bonus, simply open an account on Binarybrokerz.com by clicking on the link above. Our bonus offer will be automatically acquired. The platform used by Binarybrokerz is the well known and reliable platform developed by TradeSmarter and it encompasses all the add ons, features and tools offered, such as StrategiX, which allows for custom risk management and enables one to achieve profits of up to 380%. Completely web-based and requiring no downloads, the platform is not only feature packed but easy to navigate and simple to use, enabling customers to trade binary options in a trusted, reliable and secure environment that enhances the trading experience. Moreover, Binarybrokerz also takes care of the needs of traders wishing to trade on the go and be able to access their accounts from anywhere and at anytime, through their specially developed mobile application, which is available on the iOS as well as the Android operating systems, offering all traders incredible convenience, flexibility and speed. The Binarybrokerz website offers clients not only the traditional call/put or high/low binary options trading type, but also additional trading types, that allow each trader to be able to select their risk level, payout level, speed etc, according to their preferences, skills and objectives. Within this framework, this new broker offers both long term and short term option types, as well as the riskier one touch binary options type and the more innovative pairs trading. In short, traders are spoilt for choice, since they can either go for a simple pre-determined trade type or a more sophisticated custom-made trade, depending on their level of confidence and expertise. The tradable assets offering at Binarybrokerz includes a satisfactory number of assets from across all the major asset categories, meaning that traders can choose the asset or assets they prefer and that best suit their investment portfolio. More specifically, Binarybrokerz has 10 currencies available, including not only the more popular pairs, but also Bitcoin as well as the USD/RUB pair. Moreover, it offers trading on six different commodities including copper, crude oil and natural gas futures. Furthermore, there are 17 different stocks of major companies up for grabs, as well as 15 different indices from across the globe. On Binarybrokerz.com, clients can choose between five different account types according to the level of initial deposit they are willing to commit. 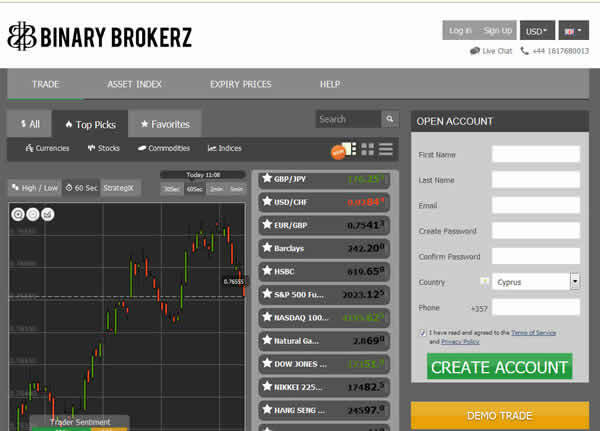 The minimum deposit to open a trading account on Binarybrokerz is $250, which gives you access to a Basic account. If you are prepared to invest more, you can open a Standard account, which has the additional benefit of offering a demo account as well. The other account types are the Advanced, the Premium and the V.I.P., which all offer bonuses, access to seminars, webinars and other training resources as well as access to a dedicated broker for each client. The level of experience and expertise of each broker grows as one moves up the account type ladder, with the Premium account holders for example being able to enjoy the guidance of a chief broker, as opposed to the junior broker assigned to those holding Basic and Standard accounts. The deposit and withdrawal procedures on Binarybrokerz are relatively straightforward and fast, similar to those offered by other brokers in the online retails binary options field. The accepted payment methods include major credit cards, such as Visa, Maestro, American Express and Mastercard, as well as Bank Wire, while the broker also accepts all a great number of e-wallets, such as Cash U, Skrill, WebMoney, Neteller and many more. The broker implements a rigorous Know Your Customer Policy and places great importance on the safety of all transactions carried out, ensuring that all customers feel secure and confident to deposit and withdraw funds to and from their trading accounts at any time. Although not accepting US traders, the Binarybrokerz website truly caters for the needs of most traders in the global community to be able to trade in their own language, since it is available in 12 different languages, including English, Arabic, German, Spanish, French, Chinese, Japanese and Russian. 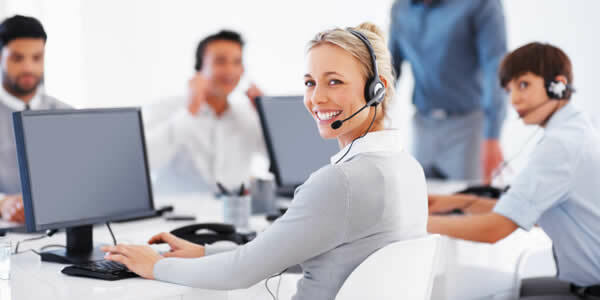 Customers can obtain information from the FAQs section of the website, while they can also contact the broker’s customer service department to get answers to their queries, either via live chat from the website, or by sending an email or by phone, with customer service being available on a 24/5 basis. One of the broker’s strongest points is the fact that it offers all its customers a very comprehensive and information packed educational center, which contains, inter alia, various informative video tutorials as well as other useful training resources aiming to equip customers with the necessary skills in order to successfully trade binary options through the Binary BrokerZ website, such as a daily market review and an economic calendar. This is a very new broker, in fact it is so new that it is still facing some teething problems, in terms of parts of its site not yet functioning completely. Although it doesn’t come with the experience and other benefits associated with other longer established rivals, it seems to compensate what it is lacking with extra commitment, enthusiasm and zeal and the innovative concept of the more personal, one-on-one approach to trading and the needs of every individual trader. Therefore, it might be a good broker to choose, especially if you are new in binary options trading, looking for expert guidance and a helping hand to lead you through the trading experience with confidence and make it as successful as possible. Binary BrokerZ have provided me with a very good experience with the help of one of their brokers, Michael who really exposed me to the experience . At first i didn’t understand how it works and what to do and lost money but after a few sessions with him i started making money.